A two-year sojourn in a small city in central China yields this youthful, gracefully impressionistic portrait of a time and place from newcomer Hessler. In 1996, Hessler reported for his Peace Corps duty to Fuling, a city of some 200,000 souls astride the murky Yangtze River, which cuts through the green and terraced mountains of Sichuan Province. 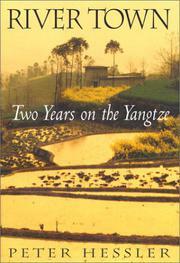 This account is a chronicle of the author’s days in Fuling and of a brief summer interlude of travel farther afield. Hessler’s writing is unselfconsciously mellow, a lazy pace that works admirably in conjuring up Fuling as a place. There is the gentle knock of the croquet ball in the morning when the court below his window comes to life. There is this river city of steps pressed against hills; there are ridgelines cut with ancient calligraphy and pictographs that disappear under water during the rainy season. There are his students—a poignant, watershed generation who delight him to no end. Big things happen while he is in China (the Three Gorges Project is in full swing and Deng Xiaoping dies), but it is the everyday stuff that is so affecting. The surprise and unpredictability of the townsfolk catch him unawares more than once, he feels the sensitivity of being a foreigner, with all eyes upon him and little cultural abrasions everywhere: “Those were our Opium Wars—quiet and meaningless battles over Chinese and American history, fueled by indirect remarks and careful innuendo.” And he loves it, despite the dislocations and frustrations: even the creepy drinking bouts at banquets (“Every banquet has a leader, a sort of alcoholic alpha male”) and the relentless mocking of his foreignness by strangers (for, although the Peace Corps is no longer considered a running-dog outfit, foreigners are nonetheless seen as freaks) become sources of nostalgia after a while. A vivid and touching tribute to a place and its people.